EXTENDED THROUGH MAY 20, 2018! This World Premiere Exhibition showcases rarely seen black and white photographs taken by Paul Child in France between 1948 and 1954. 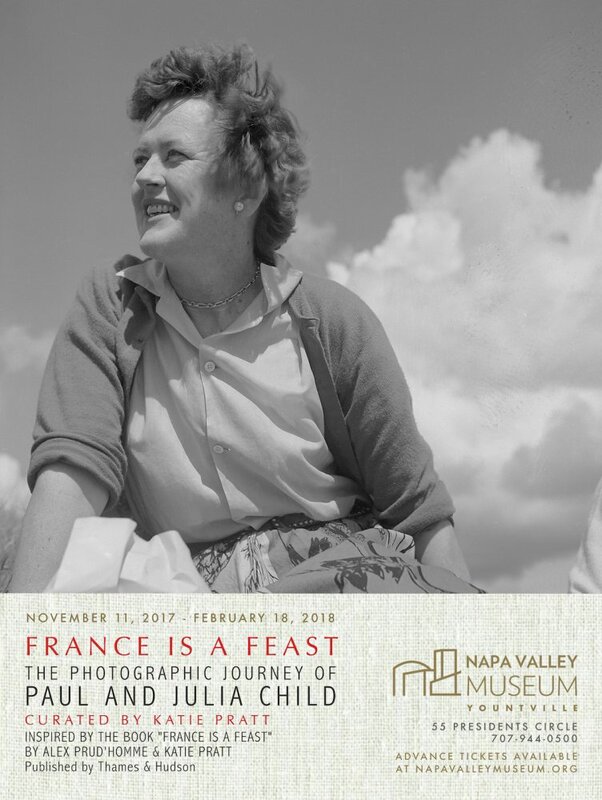 Featuring Paul’s extraordinary photographs of Paris, Marseille and the French countryside after the Second World War, the exhibit will also include rare objects and intimate pictures of Paul’s wife, Julia Child. Just Added: Our exclusive Audio Tour featuring the voice of The French Chef herself, Julia Child, and interviews with chefs Jacques Pépin, Thomas Keller, Cindy Pawlcyn, and “Julia & Jacques” television producer Susie Heller. 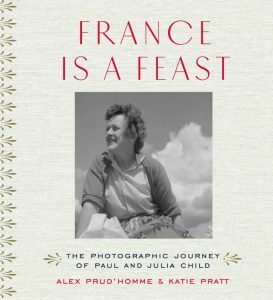 Plus Alex Prud’homme, grand-newphew of Paul Child and co-author of Julia’s best selling memoir “My Life in France.” Purchase Below. Katie Pratt was two years old when Paul and Julia Child moved to her neighborhood in Cambridge, Massachusetts. Her uncle Davis Pratt, teacher of the History of Photography at Harvard University, a former student of Paul’s, introduced them, and she stayed in touch with the Childs throughout their lives—from Cambridge to France and eventually Santa Barbara. Pratt’s early years were surrounded by art and photography—enjoying private art lessons from Paul while a teenager; learning from her mother, a water color artist; hearing about her Great-Uncle Denman Waldo Ross, a painter in the circles of Monet and Sargent. Pratt earned her BA in Art History from Boston University and pursued studies in glass arts and foreign languages in the U.S., France, Spain, and Holland. She has stayed actively involved in the art glass movement, continuing to study in Italy and the U.S.
Pratt worked with the Imogen Cunningham Trust for nearly 20 years where she also served as a Trustee and Executive Director, working closely with vintage negatives and photographs. (She worked with Richard Lorenz on several Imogen Cunningham book projects, including Flora and On the Body.) Pratt has curated photography exhibits in galleries throughout California, and in Texas, New York City, and Ireland. Since 2000, Pratt has managed, curated, and promoted The Art Program in Sun Valley, Idaho, overseeing a collection of 300 artworks and curating semi-annual art exhibits. She lives in Napa, California, pursuing an interest in wine and food. She co-published and promoted “Bay Food Magazine” in the 1980s and early ‘90s, and has worked in PR and marketing for wineries. She now makes her own wine, Katnip. With future exhibitions of Paul’s photographs Pratt hopes to further appreciation and understanding of his skills and the importance of the discerning eye in all arts. ADMISSION TO “FRANCE IS A FEAST” IS $10 ADULT, $5 SENIORS AND KIDS 16 & YOUNGER, MUSEUM MEMBERS, ACTIVE MILITARY, AND RESIDENTS OF THE CALIFORNIA VETERANS HOME ARE FREE. AUDIO TOUR IS $5, PURCHASE WITH ADMISSION.